Perfect Little Maid uses “Clean and Green” products. These products are supplied by Swish Maintenance who are the experts in complete cleaning solutions. These products are environmentally responsible. Swish Clean & Green products do not contain butyl’s, phosphates, petroleum’s, dyes or fragrances and are all non flammable. What makes these cleaners green? Swish Clean & Green products contain water, naturally derived and readily biodegradable surfactants and solvents. Perfect Little Maid uses permanent colour coded spray bottles to match each Clean & Green. They are complete with the required HMIS ratings on back of each bottle. Perfect Little Maid used a top of line , backpack vacuum with heap filter. It is approved by the Heart and Lung Association. 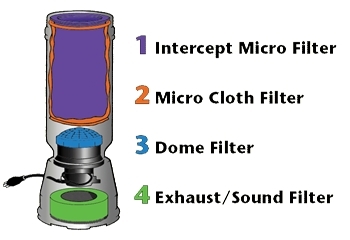 Every ProTeam vacuum collects at least 99.9% of indoor pollutants one micron or larger. Such extraordinary capture rates are the result of years of engineering with our exclusive Four Level® Filtration System (shown below). To safeguard the indoor air quality of your facilities and to optimize the performance of your vacuum cleaner.